Excellent log home and cedar wood home stain. I have a log home which we treated about 6 years ago with DeFy UV Protectant which I can't find on your website Are you no longer making it and what should I switch out to? There was not a product called "DeFy UV Protectant" in the past so more than likely the Defy Original is what you used and should use again. You can use the Defy Stains for Log Homes. The most popular are the Defy Original or the Defy Extreme. No need to apply anything on top. Redo in 2-3 years or as needed. After applying two coats of Defy Extreme Wood Stain to I need to apply a top coat on it? and how long before I need to redo this whole process? Wait a couple of months then prep with the Defy Wood Cleaner and Wood Brightener. The old deck would need to be stripped and or sanded to remove all of the old stain. Once done you would use a wood brightener. The newer deck needs a cleaner and brightener for the prep. 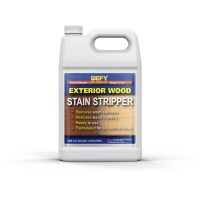 Once all the wood is properly prepped, you would want to use the Defy Extreme Stain. I have about 1000 sq foot of decking, and a pool. We live in Ohio so we get all the elements so this deck gets abused! Part of the deck is old and stain is flaking and peeling and I have green mold, what the heck do I do with that to get it ready to stain???? The new portion is just pressure treated lumber, nothing's on it but it's 2 years old and I assume needs cleaned before staining???? Finally what is your very best longest lasting stain??? I am so worried abt the 2 decks matching in color so I was going to use behrs solid color stain but I keep hearing bad reviews! Please help me, I'm ready to purchase! The Defy Stain Stripper does not remove paint. Please order online as we do not have any dealers in your area. I would look at either the Defy Original synthetic or the Defy Extreme Stain. Coverage is about 150 sq. feet per gallon. We do not have a dealer in your are but we can ship 5 gallon pails free of charge! I am building a house in Tullahoma, TN. Western Cedar siding. Which product should I use to stain, what is the coverage per gallon? Lastly, do you have a supplier in this area? For a Brazilian hardwood deck you would want the Defy Stain for hardwoods. Defy Stains are penetrating stains and do not film on top of the wood like the Behr does. I have wood from Brazil (hardwood decking) we used Behr last year it all peeled up this winter needed to strip it off what a job. Does Defy coat the wood like Behr does it peeled like nail polish it wasn't transparent. Very unhappy and afraid on what to use. I do not want to go through this again. Nothing that coats the wood. I live in southern nj. Sorry but the Defy Original Synthetic only comes in 5 gallon pails. The Defy Epoxy, Extreme, and Hardwood stains come in gallon sizes. Is there any place I can buy your preservative/stain in a gallon size? I have part of my new deck that I want to stain in a different (darker) color than the rest. My log home (white cedar) had the Defy original stain applied when built in 2001 using the #300 redwood canyon color. Several years later another coat was applied. The color is now an unattractive dark brown and has worn to the point where it needs to be recoated. What must I do to lighten the wood or strip off the existing coat? Best to prep the house buy using a stain stripper followed by a wood brightener. This will remove the finish and the mildew. This way your new stain will properly adhere and penetrate into the wood. Yes it will last as log as an oil. You can walk on the first coat. Just do not step in the second coat. OK, I've scratched my head on this for about a week and can't come up with an answer: how can I apply the second coat of stain before the first coat is dry -- without walking on the first (still wet) coat? For cedar wood we would suggest the [url=http://www.defystain.com/defy-hardwood-stain.html]Defy Hardwood/Cedar stain[/url]. It penetrates cedar better which it makes it easier for reapplication without stripping in the future. We have a deck made from cedar. We used a Behr semitransparent weatherproofing stain on it when it was new about 4 years ago. It did not stay looking good for more than a year. Which product from DEFY will provide a protection that we can just add to every year without having to strip off the old every year prior to applying DEFY. We have sanded and stripped off the old Behr product and are ready to order from you. Please advise. Thanks. The Defy stains do not contain animal fat and do not turn black over time. 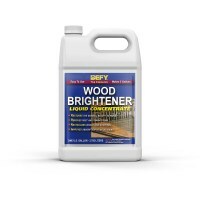 The Defy Extreme would be the best stain for your pressure treated wood. hi, what is the difference between the defy orignal synthetic, the epoxy stain, and the extreme stain. i have pressure treated wood for my deck. do these stains have any preservatives in them or animal fat. i here this is what causes the wood to turn black over time. my deck is in the afternoon sun. i live in n.j. where can i buy this.